League Ambassadors are specially appointed individuals who have demonstrated consistent and enthusiastic participation in the Texas Karate League. Their role is to represent and actively promote the benefits of the League to other black belts, martial arts schools, and potential competitors who are not involved with the TKL currently. Master Amy Seeling is a 7th degree black belt in American Tae Kwon Do, brown belt in Aikido and blue belt in Brazilian Jiu Jitsu. She is the owner of North Texas Karate Academy, established in Fort Worth, Texas in 2003. Her husband and two sons are also black belts. She has been a 10X time Texas state champion with the Amateur Organization of Karate, and is the 2016 Texas Karate League Eagle Award Recipient. Master Seeling is the author of the newly published Elijashen and Ariah books in her King and I Series. Master Seeling works as a Data Architect/Business Analyst in the energy sector. 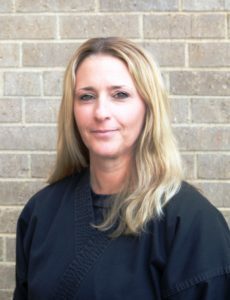 Master Jackie Self, owner of Ennis Black Belt Academy, started her martial arts training in 1976 under the instruction of Grandmaster Roy Kurban. As a competitor, she is a six-time winner of the coveted Eagle Award for high point in the Traditional Karate League. She has since helped create the Texas Karate League as one of its founding directors and has served in this capacity for the past 10 yrs. As the owner and chief instructor of the Ennis Black Belt Academy, Master Self has produced over 35 black belts within the past 20 years.